Motorcycle click on 'direct to battery' charging cable with dedicated power connector for the Samsung Galaxy S5. Specially designed to fit the Ultimate Addons Galaxy S5 Tough / Hard Case (case NOT included). Uses the patented 3-prong attachment system. Incorporates a 3-prong (female) on base of switch box and 3-prong (male) on the top so it fits in between your Ultimate Addons bike mount & cradle/case. Acts as an extension to an Ultimate Addons mount - adds around 3cm (1.18") to the height of the mount base - gives a little more clearance and adjustment. Comes with an Ultimate Addons Galaxy S5 power connector. Length approx 2m (79") to terminal connectors. Replaceable blade fuse with waterproof rubber cap. Reverse voltage, short-circuit & overload protection. Switch box size 6cm x 2.4cm x 3.9cm. 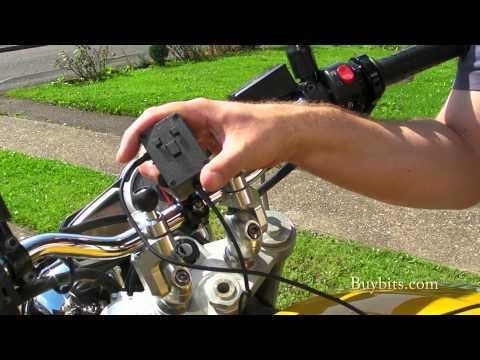 Motorcycle click on 'direct to battery' charging cable with dedicated power connector for the Samsung Galaxy S5. Specially designed to fit the Ultimate Addons Galaxy S5 Tough / Hard Case (case NOT included). Uses the patented 3-prong attachment system. Incorporates a 3-prong (female) on base of switch box and 3-prong (male) on the top so it fits in between your Ultimate Addons bike mount & cradle/case. This new design is ideal if it's inconvenient to access under your motorcycle seat. Acts as an extension to an Ultimate Addons mount - adds around 3cm (1.18") to the height of the mount base - gives a little more clearance and adjustment. Supplied with an Ultimate Addons Galaxy S5 power connector. Waterproof ON / OFF switch with LED power indicator - will not drain your battery when stored. Length approx 2m (79") to terminal connectors. What's included? 1 x new design Ultimate Addons 'Direct to Battery' Motorcycle Cable; 1 x Galaxy S5 connector. (Case & mount NOT included).